Image courtesy of LABOR and the artist, photograph by Ramiro Chaves. Irene Kopelman works at the intersection of art and science. 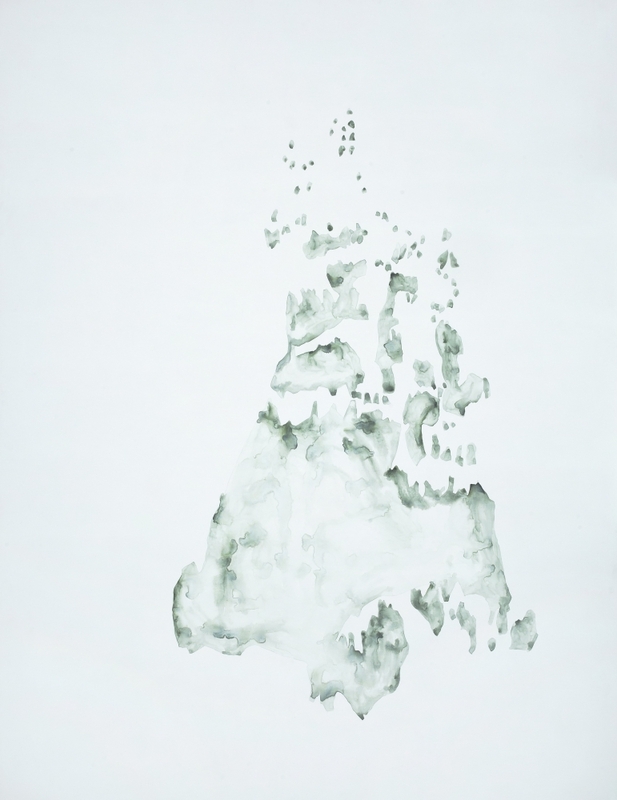 She participates in scientific expeditions to remote places in order to seek out and study the natural processes, patterns, and forms which are often imperceptible to the untrained eye, and which she attempts to understand through drawing. For Independent Brussels, she will present a solo booth with the Mexico City based gallery Labor. What will you show at Independent Brussels? We will present part of my project entitled On Glaciers and Avalanches which I began during my year-long residency at the Foundation Lawrenz House in Basel. At that time, I started working with different research institutes based in Switzerland such as the World Glacier Monitoring Service, and the Institute for Snow and Avalanche Research. Through these collaborations, I developed several series of works related to glaciers and avalanches. At Independent, I will show large paintings and sculptures from this body of work. What does your collaboration with scientists entail, and how do you translate these experiences into artworks? I accompany scientists during their field research. I follow them around, and I listen to their explanations. Nature creates certain shapes and patterns for very clear reasons, and that’s why it’s interesting for me to hang out with scientists because they read the landscape in a way that we cannot. On these expeditions, I always start by drawing and sometimes, if the circumstances allow for it, I use watercolors. I can only connect to the landscape and understand its patterns and forms through drawing it. Switzerland, in particular, has a very long history of landscape drawing which made it hard for me to engage with the environment. But that’s what science gives to me; it reveals a fascinating micro-history which offers a point of entry. I choose only one element from the landscape, and that’s why my images look abstract. For example, if I’m drawing the forest I might focus on the shadows. I select one variable among many, but I stick to what I see. The information is really there; I don’t invent anything. The form an artwork takes depends on the landscape and the research around it. In Switzerland, for example, the imagery in my drawings and watercolors lent themselves to large paintings and sculpture. The structure of the ice has a very sculptural quality. Your work seems to undermine the commonly held belief that art is purely a product of human culture. It appears to reflect a false division between the subjective human world and the objective non-human natural world. What are your thoughts on this? Yes, in my work I observe nature, so it’s not so much about me. I mean, I’m obviously there, and I try to find ways to fit into a particular context, but it is really about capturing the structure of nature. Lately, I’ve been working a lot with geologists and in relation to the history of geology and of nature in general, humans are such a super small thing, basically nothing. Humans play a very minor role in the ecosystem, and engaging with specialists makes me very aware of that. I’m also influenced by the 18th and 19th century naturalists because at that time drawing and science were much more interconnected than they are now. There was always someone drawing on expeditions, and the disciplines were less divided. One of the most fascinating things that I learned in Switzerland was that before the invention of photography certain artists like Samuel Birmann made extremely precise paintings of glaciers. And even though Birmann probably didn’t intend for his works to be used for scientific purposes, researchers have studied them to understand the morphology of glaciers at that time. Why is it important for you to work in situ, often times under extreme conditions? I believe that a given situation and experience affects your decision making when you draw. In Antarctica, for example, you can stay outside for only three hours because it’s so cold. So, you draw in a certain way because you’re freezing and you know you have very little time or maybe you know that you can’t draw tomorrow because there’s a storm coming. I’m interested in this relationship you have with the place; I think it pushes you into certain corners of your mind which are more challenging for me than if I were sitting in my studio, in a controlled environment, working from a photograph. Your work has been described in terms of the sublime or transcendence, and yet it seems rather to express a beauty immanent in the world. I think the only way that my work relates to the sublime is that there is a feeling of excess. Nature is overpowering, but the power of nature doesn’t have to do with any kind of mystical transcendence. Once you talk about nature in your work people see it as religious in some way, but it’s not for me. The idea of beauty is not very hip lately, but we forget that beauty is extremely complex. When you investigate nature, you discover that form is the result of a very complex process. You are interested in forms or events that are perceptible only at very specific moments in time. You also explore the changing patterns and the emergent processes of nature. Could you discuss the role of time and change in your work? Yes, every landscape offers a temporal history, and scientists can see this visually. It’s basically a language that they can unveil. With the trees that I studied in Davos, Switzerland the scientists would take a little part of the tree core, and they could trace the history of the forest through the lines. So, in a way, the history of the landscape is embedded in the tree. Nature is about evolution; it is ongoing and on growing. It keeps creating new forms and that’s why I’m interested in it. No matter how many trees you look at, each one will always be different. The variation is infinite. The timescale depends on what you’re working with. For example, the rainforest changes very quickly, so if I go back again I probably won’t find the same things. Geology goes slower, of course. It’s quite amazing to realize that certain forms appear just briefly. My practice is about catching a glimpse of these moments.